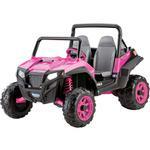 Driving around the yard in their own RZR, hauling everything imaginable in their large sport bed with tie-down anchors. 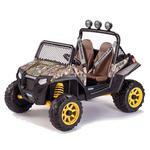 The 2-speed shifter with reverse allows them to drive at 2½ or 5 mph on grass, dirt or hard surfaces. Parents will appreciate the adjustable bucket seats for growing children and the 5 mph lockout that prevents beginners from going too fast. 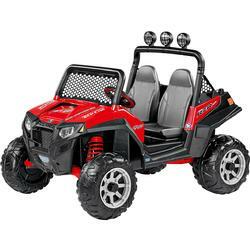 2-Speeds -2.5 to 5 mph on grass, dirt or hard surfaces (5 mph lockout for beginners). Reverse -Switches easily to reverse mode, just like the real deal. Haul It -Large sport bed with tie-down anchors. 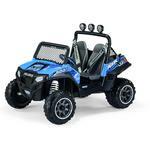 The Works -Includes off-road windshield, roll-bar, and cup holders.